Comparing prices for single invoice finance is not quite as straightforward as you might expect. I have just been looking at an example of some costings sourced for a prospective customer and there are numerous different pricing systems being used by the different invoice finance companies that we have spoken to. It is always worth comparing selective quotes against other forms of invoice finance, see our guide for details. The first method of charging is what could be described as a "single fee" or "flat fee" pricing structure. This method only includes a single charge but this can be made against either the value of the invoices, or the value of the funds in use (the amount that you are overdrawn with the funder) e.g. 2.5% of invoice value, if charged against value, or a percentage of the funds in use, for a given period. Yet again, the method of charging is not consistent between providers, in a number of cases the period for the charge against funds in use is per 30 days, however in some cases it is per 15 days or it may be charged daily. The can even be combinations e.g. X% for the first 30 days and they Y% per day thereafter, others use a scale of increasing percentages for each block of days the funding is outstanding. The second methodology is closer to the traditional method of charging for invoice finance facilities, involving two separate charges, one against the value of the invoices (often referred to as service charge or processing fee), and the other against the funds in use (often call the discount fee/charge or interest). The percentages charged will vary between providers, and for different customers. Again there are several variations on how these work in detail. In some cases the discount fee will be per day, in others it will be for the first block of days and then subsequent blocks or individual days thereafter. 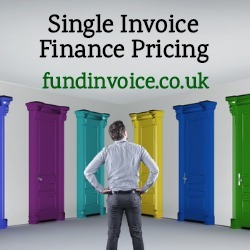 If you have quotes for single invoice finance already and you want to see how they compare to other providers, or if you want to see what various funders would charge your company, we are always happy to get the quote for you, and to explain how the pricing works. It is often worth comparing with whole turnover quotes as we have been able to save customers a lot of money by obtaining a quote for funding all their invoices, which can often work out significantly cheaper than using a selective facility regularly. Research: Summary of our invoice finance pricing research. Article: How funders calculate charges.